Businesses in Asia will boom with a custom FREE .ASIA at Crazy Domains! Asia leads the world when it comes to online business, with established market leaders in Hong Kong and Singapore as well as up-and-coming markets in Indonesia, Malaysia and the Philippines. Customers who have business interests in Asia will be able to take the best advantage of Crazy Domains' latest promo. The .ASIA domain is available for registration – for FREE, leveraging localised presence like never before. 3.8 million people go online for the first time every month in Southeast Asia, and Crazy Domains is poised to expand influence in the region. Now, new customers can get .ASIA websites plus email addresses for FREE, for 1 whole year. Crazy Domains knows how important it is to have a custom email for business. With the free .ASIA offer, customers can also enjoy a free email address, owning their online identity in the best way. With dedicated email, there is more authority across all communications, building trust and improving delivery and open rates. This serves as free advertisement for businesses, building a good first impression with the best impact. Stand out in the crowded online space with .ASIA! .ASIA is the dedicated domain for the world's fastest growing region. With a recognisable domain name, businesses all over Malaysia, Indonesia, Singapore, Hong Kong and the Philippines can distinguish themselves in the crowded online marketplace, with more branding opportunities to take advantage of. Crazy Domains is a trusted and affordable online service provider offering premium service through innovative products for online growth. With the free .ASIA campaign, everyone from businesses to bloggers in the five Asian marketplaces can enjoy features never seen before! Customers not only experience these free perks from the promo, but they also get to experience expert 24/7 support service through live chat, social media, email and call. 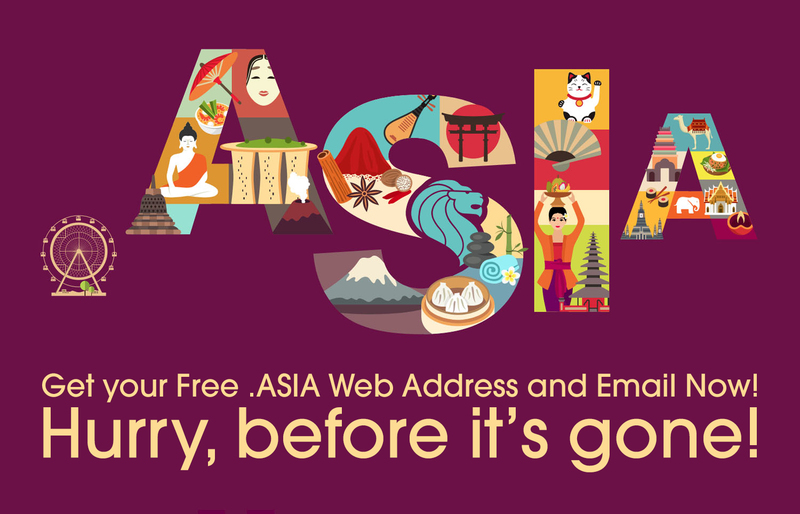 Get started at Crazy Domains today and discover why Asians go crazy for FREE .ASIA! Offer is available for a limited time only! Anyone looking to jumpstart online presence in Asia should take advantage before it's gone! *Cannot be used in conjunction with any other offer, sale, discount or promotion. After the initial purchase term, products will renew at the then-current renewal list price. Offer does not apply to Premium domains, renewals or transfers. Offer applies to residents of Malaysia, Singapore, Hong Kong, Indonesia and Philippines only, and is strictly limited to one order per customer. Free email hosting is dependent on a live .ASIA domain. Dreamscape Networks FZ-LLC reserves the right to refuse, cancel or delete an order under any circumstances or basis at its discretion and shall not be held liable for any matters resulting from such actions. A fee will apply to unlock DNS settings of all domains registered as part of this offer.